Our approach goes beyond traditional valuations in terms of risk assessment in order to be aligned with the highest standards of the private equity industry. Advanced Valuations with stochastic risk assessments based on macro economy, market, strategy, technology, operative and financial drivers (as shown in the figure below). Our approach goes beyond traditional valuations in terms of risk assessment. Macro economic, market and operative variables drive our advanced risk and valuation models aimed at improving investment decisions. The DCF at risk methodology shows the flow of the business detailing the impact of each driver and the final value at risk: rNPV, & VaR based on NAV volatility. Risk-value variables are subject to volatility driven by both history and strategic studies. Our approach goes beyond traditional valuations in terms of risk assessment in order to be aligned with the highest standards of the private equity industry. Our advanced models are made to improve investment decisions by measuring and showing the impact of macro economic, market, strategic, technological, and operative variables (as shown in the figure below). We display stochastic⁽¹⁾ and probabilistic scenarios in which risk-value variables are subject to volatility. Downside risk is the probability of having a decline in the value of an investment or project if the market conditions change. On the contrary upside risk is the probability of having an increase of value if the market conditions change. Downside risk explains a worst case scenario for an investment or indicates how much the investor stands to lose. We use different metrics to estimate the likelihood that an investment’s value will decline, including historical performance and standard deviation calculations based on our advanced models and forecasts. 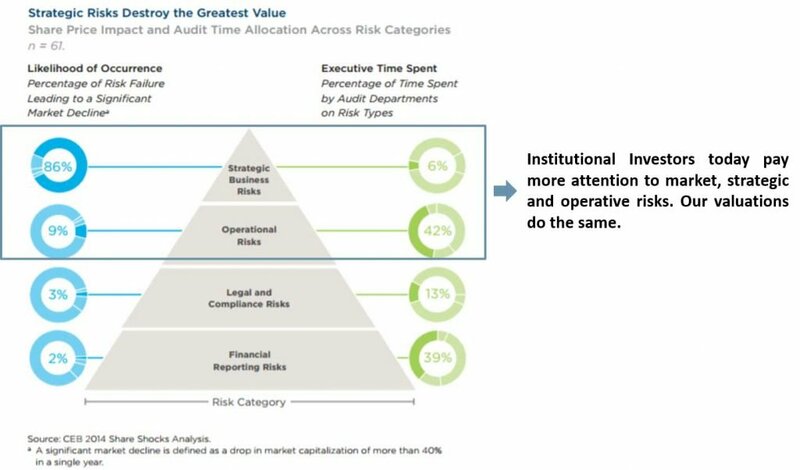 In traditional valuation processes, risk assessment and attention has historically focused more than half its time on legal, compliance , and financial reporting functions. However, most big hits come from market, macro economic, strategic and operative risks. We determine the risk profile of any investment, start up project, intangible asset, and privately held company in order compare it with the risk profile of other market investments and leverage its potential. By analysing and understanding the return or value distribution of an investment which is affected by internal (company variables) or external (market variables) drivers, we can show how to mitigate the risk and how optimize the risk-return trade-off through portfolio management and other alternative investments. In the figure below, we compare the return distribution of the S&P 500 with the IRR of an hypothetical investment. Both investments are driven by different market drivers. We use metrics like standard deviation, kurtosis and skewness to analyse the risk profile of a given investment. In the charts below, we show a sample in which we position the return of an Investment in terms of Standard deviation, Kurtosis, and skewness and compare them with other known market investments.